This may come as a surprise to some. For the record, due to recent developments, I have "changed my mind" from November about U.S. bear-market prospects. I think the worst in US markets is now behind us. What I see brings back memories of less than 10 years ago. It looks like October 1998 all over again and I now believe we had a serious shock, but we're not going into a typical, prolonged, bear market. So I'm raising the "almost all clear" flag now. I've been buying in the past two weeks as I outlined in my previous column and I'm now getting almost fully invested in a selective way. What changed in the past 2+ months since I raised the bear flag to make me change my view of the markets in such a dramatic way? The extreme pessimism I see everywhere. Even the ones who see some upside, are too cautious, Barron's for example just had a long article explaining why it is not time to jump on board yet. I loved the recent BusinessWeek issue: "Market Reckoning" on the cover, then the one after with the big red "Meltdown!" cover. Choke of very bleak predictions. Somber and depressing analysis throughout. This is the kind of financial commentary you normally see close to market bottoms. Just a couple of months ago, pundits were explaining why this is a slow down but not a recession. Now, most economy observers seem to have shifted from the "no recession" view to a "global recession is here". You can see the broad consensus everywhere, e.g: bankers in Davos mostly agree. The latest 0.6% annual US GDP growth number seems to have shocked the most starry eyed Polyannas. Wasn't anyone watching the ECRI weekly leading indicators? You should know that stock markets look beyond recessions. Market downturns more often precede recessions rather than follow them. I think we already had ours between October and Jan 23rd. We may see some more turbulence, but I believe it'll be short lived and an opportunity to buy. The bargain valuations are now everywhere. The number of stocks trading below book value is now approaching historical high. 60.4% according to Goldman Sachs Research, up from 35.2% in 2006. There's a significant "reverse wealth effect". I only began to realize how significant it is in the past few months. For hundreds of years, investment money used to flow from developed countries to developing/poor countries. No longer. The Sovereign Wealth Funds (SWFs) with their 2 trillion of excess petro-dollars, have already started to buy distressed US companies (See Citicorp). The SWFs should make sure a solid floor is established. As small investors we are very lucky: we don't have trillions, so we can move to fully invested positions in one day. In other words, we can front-run the SWF trillions flowing into distressed U.S stocks and they will. The fact that most world markets are already down 20% from the October peak to the January 23rd trough. Technically, 20% down is a bear market. It is always better to buy after a drop than the alternative. The two significant rate-cuts which effectively froze ARM (Adjustable Rate Mortgage) rate resets from going up. Fed rates are already at 3.0%. LIBOR should catch-up soon. This implies that the average mortgage rate ARM reset in the US in 2008 will be just +8% in monthly payments, rather than +33% before the two recent unusually big rate cuts. Source: Bloomberg. Almost everyone now assumes the "monolines" (Bond insurers: MBIA and AMBAC) will go out of business. This is already priced in the markets, and any mild positive surprise is going to help. The situation with these two is very close to resolution. See this Bloomberg fascinating article. Once this issue is resolved (either way), the darkest remaining uncertainty cloud will be gone. The very sharp recent rise in bond prices: Bonds have jumped so dramatically in the past few months, that they are now historically overvalued vs stocks based on yields. Moreover, assuming inflation picks up, and all indications now seem to support it, bonds and fixed-income are one of the worst possible places to be invested in. The question is: if so much money has already moved into bonds (and cash), where would it move now? The amount of rumored "still pending" write-offs from CDOs/SIVs (by some accounts 500B to 1T), now seems to be grossly overstated given the recent rate cuts and the new ARM reset picture. Millions are going to refinance, monthly payment streams are going to stabilize and CDOs should be more realistically rated, and marked to market. Most importantly: financial companies which are priced for doomsday's scenarios, will greatly benefit from low rates again. The extreme capitulation floor of Jan 22-23. Exchanges saw Advance/Decline ratios that were not seen for nearly 20-30 years (During the 1981 bear and 1987 crash). The 2002 and 2001 bottoms didn't even come close to the market internals extremes seen on Jan 22-23. The French Bank Societe Generale $73B position unwinding, right at the bottom, was very much like the bailing out of LTCM in 1998: a climatic event from which the markets went up and away and didn't look back for many months. The fact that financials have been leading this recovery in remarkable consistency and strength despite terrible news. There's one sector which is so written off, so unloved, that even I cannot bring myself to buy: the US home builders. And yet, even they are now up, big. There's still a huge amount of cash on the sidelines. Many hedge funds and momentum players who fled stock in the November to January period will have to get back in in the next several months. This is a lot of fuel to keep this rally going on for a long time. Note that all the above has little to do with whether there's a recession or not. There may well be a recession. US house prices may continue to drop for a while, some sectors may take longer to recover, some companies will lay-off workers, and some will even go out of business. My thinking is based on the fact markets are about 6 months forward looking, that in every downturn there are sectors and asset classes which lead the downturn, and others which lead the recovery and are the first to move up. Financials have already been in a year long bear market, and they seem to be a good place to be now. I'm getting close to 100% invested. I always keep some cash for the case a new opportunity presents itself. I'm already overweight financials, including 2010 out-of-the-money LEAPS on Citicorp (+WRVAF) which are up 43.28% (as of Jan 31) since my buy less than 2 weeks ago, I also hold Goldman Sachs LEAPS, and two financial ETFs: Leveraged US financials (UYG) and preferred financials (PGF) which pays a nice dividend too. I'm planning to dip into insurance companies (see below) which are now close to the low end of their historical valuations. I'm overweight U.S. and avoiding Europe as long as their central banks stay behind the curve and the slowdown keeps spreading globally. I'm overweighting small cap over large cap. This is too good to be true, but my semi-neglected Marketocracy portfolio is now ([updated] as of this writing, Jan 31, 2008) over 16% ahead of the S&P500 for the past 12 months. 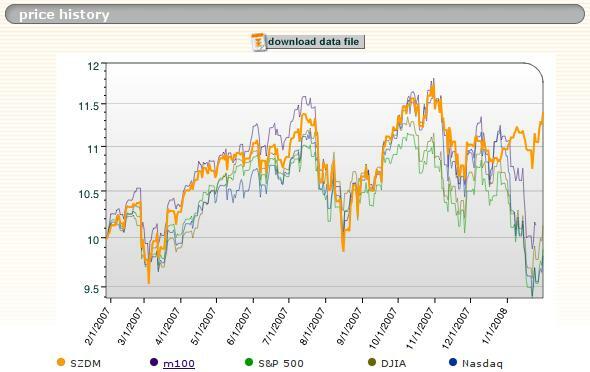 Maybe more surprisingly, it is now way ahead of the m100 average (best 100 portfolios on Marketocracy). This wouldn't be so good in itself, but its beta vs the S&P500 is down to 0.37. Luck can come and go. I made some mistakes too. I was two weeks early covering my leveraged ETF shorts. I should have waited for the cataclysmic capitulation. My record is by no means long enough to feel too good about it yet. This past 2 months record is not very likely to be repeated soon. I'm still working on the skill vs luck part.